When this healthcare software company first began working with Primary Intelligence, it was clear they had built a strong product. And yet, the company couldn’t move its win rate. The sales leaders had some anecdotal information from the sales reps, but were unsure what needed to change. The company implemented Win Loss Analysis with Primary Intelligence. Through the program, the leadership learned they needed to demonstrate the value of their product to users instead of the financial decision-maker. Once changes were implemented, the wins and revenue followed. The company had a stagnant win rate, sitting around 40% to 41% for two years. It was unclear how to make meaningful changes to improve the win rate. Anecdotal feedback trickled in from the sales force, but there was no sustained mechanism to understand deal outcomes or listen to customers. The two key sales leaders (the Senior Vice President of Sales & Marketing and the Vice President of Market Opportunities) needed more information. The company partnered with Primary Intelligence to implement a Win Loss program. The goal was to teach the company more about the needs of their target buyer, what the evaluation and selection process was like, and the competitive environment as a whole. By understanding those areas, Primary Intelligence could help the company uncover what to change to improve the win rate. Chris, the Vice President of Market Opportunities, appreciated the objectivity of the program. The program began with a limited number of interviews with buyers from opportunities from the previous year to gain a benchmark. “This initial set of data gave us some great information to begin planning changes and improvements in our sales, support, and product management strategy,” said Angie, the Senior Vice President of Sales and Marketing. Soon after, win loss interviewing was integrated into current deals. “We built a process to make win loss analysis part of our everyday activities. When we won or lost a deal, we always sent the deal to Primary Intelligence for a formal interview,” said Angie. The program also included an internal communication plan. Buyer interviews were read as soon as available, sales leaders discussed the findings monthly, and several times a year the results were discussed with the entire sales team. 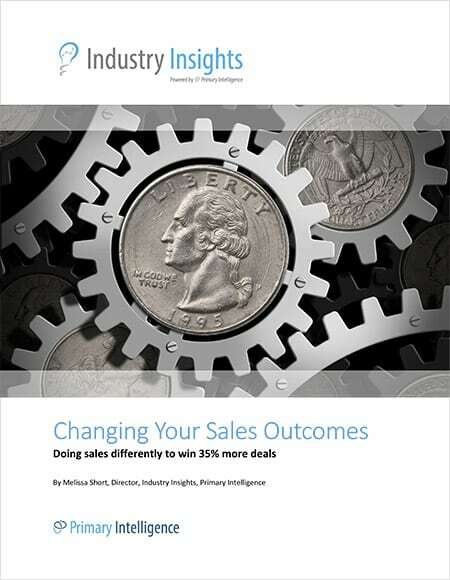 Primary Intelligence’s buyer interviews helped the company uncover a number key insights about their buyers, which in turn uncovered issues with some areas of the sales process. To start, the current sales process focused primarily on the financial buyer, the Hospital Administrator, rather than the technical buyer, the Director of Nursing. The data showed that if the sales team did not include the Director of Nursing in the process, or if they failed to gather support from this stakeholder, they had very little chance of winning the opportunity. While the financial buyer would always be an important element of the decision, the company needed to target the Director of Nursing first to gain momentum for the final decision. “This was a total surprise to us." The company's senior leaders began implementing changes based on the revealed insights. The early visits also allowed the company to begin targeting the Director of Nursing. The sales team made a focused effort to gather the needs and potential roadblocks to earning the support from the Director of Nursing. Marketing materials and sales language was also adjusted to better appeal to the needs of someone in that role. After a year of Win Loss Analysis with Primary Intelligence, the company boosted its win rate from 40% to 63%, which is an increase of 58%. The company credits the change with the insights and action taken.